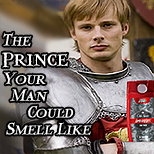 Summary: Even a medieval man should smell like a man, man. Arthur feels the need to share this fact with the ladies - and manservants - of the world. Sir William of Deira helps out. Merlin...is long-suffering. (But he does kind of like how Arthur smells. Shh.) Rated...PGish? Notes: BBC + Shine + Old Spice + Allergy-Sinus meds = this. I own only the drugs. I solemnly swear that no more than one box was purchased and I have no plans to start a meth lab from the contents. Vielen Dank to Maeyan, Len, and Lainey for enabling the crazy. Used without permission for personal entertainment only; no profit made.